Of course we’ve read the book and seen the film, but we were intrigued to see how a play would be able to convey the magic of E.Nesbit’s The Railway Children, given that much of the action takes place at an...um... railway station, and does of course includes several trains. 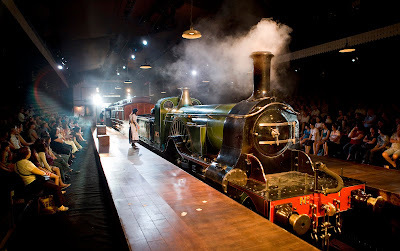 It soon became apparent that although the play is being performed at the old Eurostar station at Waterloo (they’ve converted one of the old platforms into a theatre), much of the locomotive action takes place on the cleverly constructed stage – giant wooden blocks. Not that it mattered, as we quickly became caught up with the lives of Bobbie, Peter and Phyllis. I’d forgotten how moving the story is, and actually it’s surprisingly modern and relevant, particularly as it deals with a family living in reduced circumstances and learning they can have ‘butter or jam, but not both’. Nothing was missed out, including the landslide/red bloomers incident, the Old Gentleman coming to the rescue of the children’s mother, and her decision to shelter a Russian refugee. The performances are brilliant and there are a few familiar faces, including the wonderful Marshall Lancaster (Chris from Ashes to Ashes) as Mr Perks. 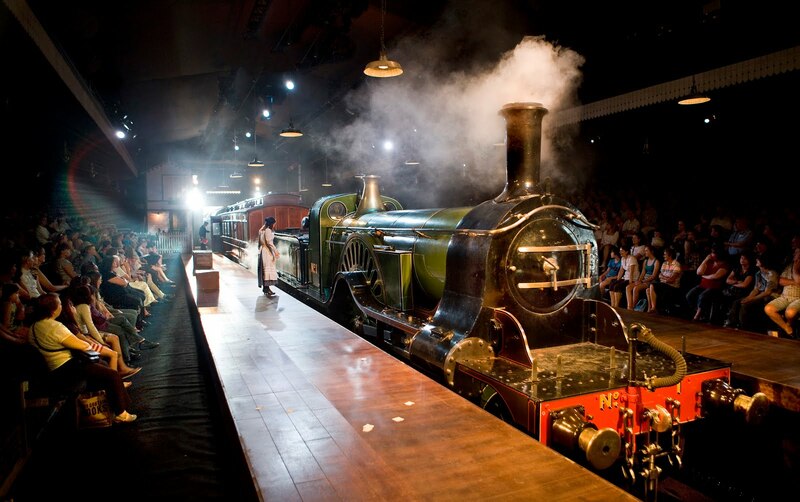 But one of the most magical moments has to be when a real live steam train pulls into the middle of the stage. All you could hear at that point were gasps of amazement around the auditorium. I was in tears. 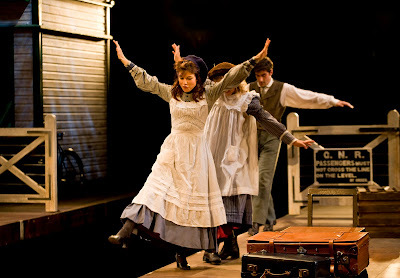 *The Railway Children has been made possible with the support of Welcome To Yorkshire (and it certainly made me want to go there). It runs until 4 September and is selling out fast. Recommended for children ages six and up.